Is there a way to select to nodes on a path and join them? You can join paths selecting them, a right click and "Join Paths". I know this´ll make a compound path - but how do you connect two end points? Say you want to draw a vase. Draw one half - duplicate - mirror - align - "reverse order" of the mirrored path and now? I tried all I can think of - making end points "connectors" - joining will double the end-points. I know I can use closed shape and do a Boolean Union with overlapping shapes and convert to path and delete the mid points at the mirrored axis - which isn´t as precise as it could be by just snapping and joining end points. Hmm, there isn't a way to join the anchor points, just the paths, but you can try converting your lines to borders and then join them (right click and "vectorize border"). To create symmetric objects, I usually duplicate and merge a filled shape, or use the bezigon and the snapping with the Grid turned on. I think it is a basic feature and it is a must to illustration and logo design. The "Modify>Path>Connect path lines" is not handy like selecting two nodes and join them. By the way "connect path" sometimes doesn't work even using the "Modify>Path>Reverse order". There is any chance to implement this? Thanks for the suggestions, I’ve created an internal feature request. We already have both in “Modify > Path” in the menu bar. “Break Curve” functions a bit differently than in Affinity Designer, however, as it just creates another point, but doesn’t open the path at this point. We will improve this functionality in the future. I just spent an hour trying to get this work. 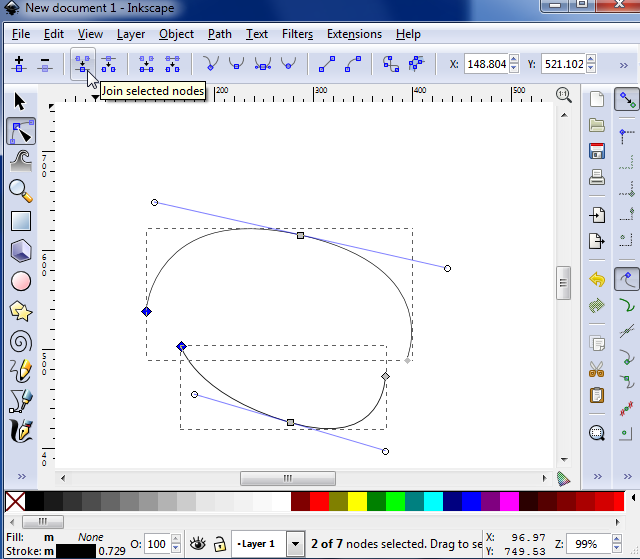 From Inkscape, I know a number of buttons that accomplish this task in an easy and flexible way. Please look into this feature - it really is essential! It would be nice to be able to select two endpoints with the direct selection tool and then rightclick->join . Result would be a straight path connection between endpoints. Yea, this is a deciding factor for me. A very basic and vital function, that has gone unaddressed for 18 months. Time to move on after only an hour of testing. Come on now, this is a basic function! Why would someone pay for Gravit when they can pay for Illustrator and get hundreds of more features?